I am a young mother. I was depressed and I had lost all interest in physical activity because I lost my father three years ago and being outdoors reminded me of my father. 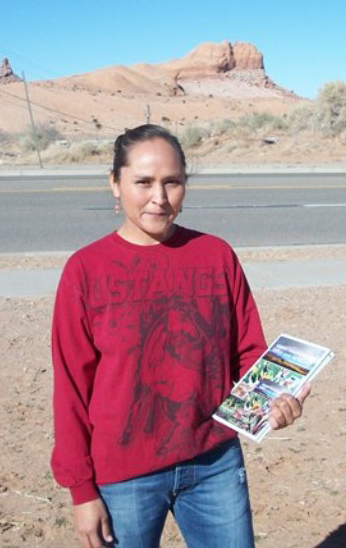 During the summer, I joined one of the hikes with my teenage daughter in Kayenta, Arizona. On the hike, we all shared stories of taking positive characteristics from Mother Nature and how we can better ourselves. I shared how Mother Nature reminded me of my father. We used to herd sheep and tend to our livestock together as a family, but after my father passed away, I no longer wanted to be outdoors. But on this day, I was happy to be out hiking with our group. I was surprised how therapeutic it was for me. I finally accepted my father’s death and I vowed to exercise with my family. Now, I participate in most of the events by Navajo Nation Special Diabetes Project to better my life with my family. I attend the walks, runs, hikes, cooking-demonstration classes, softball tournaments, and other activities. I have lost over 15 pounds, and now, I cook only from the vegan diet recipes. My family has more energy; and they run every morning and we pray together. I love the Navajo Nation Special Diabetes Project for being a part of my healing process. My teenage daughter is grateful that I came back to the family. I didn’t know it was affecting my family that much. She is very thankful that we went on that hike, and she says, it gave me back to them.